I’ve just returned from a sketching trip to the English Lake District, having experienced a variety of weather conditions, making for some interesting and varied sketching outdoors. The best day was when I climbed to the summits of the Coniston peaks on a sunny day. I aimed initially for Swirl How, from which there are marvellous views all round, and at that level extensive snow made them even more impressive. I was perfectly happy sitting in the snow painting a watercolour sketch and sipping a coffee with hardly a breath of wind. When I moved further south along the ridge and looked back the southern aspects of the mountains were completely devoid of snow. Had I done the trip the other way round I’d have been really disappointed with the views northwards. The sketch I’m showing, though, is one done in light rain, using a watersoluble pencil on a cartridge pad. As you can see it has quite a few notes and a slightly different view of the bridge itself from higher up, at the top of the page. From my position below the falls the bridge was mainly obscured by branches – in summer it would have been impossible to see, but by moving around a little I was able to piece together the main bridge structure, reducing the number of branches. I then moved higher up, almost on a level with the bridge, and drew in the details as seen at the top of the page. This explained the structure of its rather unusual, but attractive shape, and was helpful even though the perspective was naturally quite different from the first drawing. I backed it up with photographs, but this is a case which clearly shows the advantage of a drawing, both for the main overall subject, and those little bits of detail that can lend an authentic feeling to your work. You can find the lovely old bridge on the track up to the Coniston Coppermines Valley, where it levels out, but take care as there are steep and deep drops into Church Beck. I’m glad to say that I’ve now handed my book on painting winter landscapes over to my publisher, to be published in the autumn, but this one sketch gives you a good idea of the advantages of getting out there before all that dreaded greenery arrives! 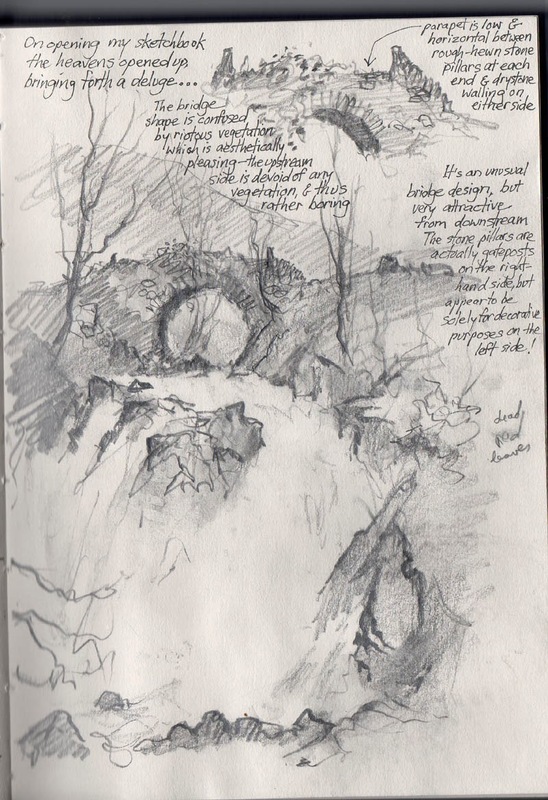 This entry was posted in David Bellamy, sketching, Sketching in winter, sketching outdoors by David Bellamy. Bookmark the permalink. Always enjoy your paintings of the Lake District, this sketch looks great. Can’t wait for the new book in the autumn. Always interesting and very helpful to read these tips. Am putting into practice much of what I’ve been watching on your great DVDs and in your books – really helpful. Thanks David.